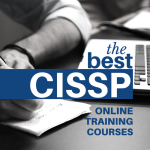 What’s are the best CISA prep courses? What is the best CISA training course? Choosing the right CISA course is the single most important decision you will make on your journey towards becoming a Certified Information Systems Auditor. You will be spending countless hours studying with it, so it’s crucial to find the one that best fits your learning style. So here’s the good news – I have personally tested and demoed the most popular online CISA prep courses on the market so you don’t have to! The comparison chart below will help you figure out which one best fits your needs. Research the best CISA review courses below. Adaptive Learning: Surgent CISA Review has what they call “adaptive learning”. Beyond the marketing hype what that really means is you get to focus on the questions that you have trouble with and pass faster. It’s personalized learning at it’s best and definitely something you want to consider when choosing a CISA prep course. Pass or Refund: While you’ll never get back all the time you invested in studying, if you fail you’ll at least get your money back. Passing requires demonstrating a competence in all six areas during the four-hour, 200 multiple-choice question exam. A minimum score of 450 demonstrates a consistent standard of knowledge. Intuitive Dashboard: The Surgent test prep platform has just been updated. It’s easy to use, works on your phone or tabled and keeps everything you need within reach. The Bottom Line: Surgent offers a cutting-edge prep course with their highly intuitive dashboard backed by powerful adaptive learning technology. In the unlikely event that students fail to pass the exam, they also offer a generous refund policy. Up-To-Date Content: Their course content is updated twice yearly to include the newest content according to ISACA’s latest exam objectives. This is a very important feature for an exam prep course to have and helps ensure that you will be adequately prepared for the latest version of the exam. Among their updated content lies over 900 practice questions and 4 comprehensive exams. Free Demo: Certified Information Security is so confident in their course that they let students try it for free. You can just click the “Preview Now” button on the course page and it will take you right to the fully interactive SuperReview. You will be able to listen to select lectures and even take the assessments (quizzes) that follow. Earn CPE Credit: Once someone becomes a Certified Information Systems Auditor they will need to earn 40 CPE credits each year to maintain their certification; this course can be counted towards all 40 credits. It is a flexible and affordable online solution. Student Support: Students are provided with personal support from the course author Allen Keele by phone and through email. It is not every day you will find instructor support over the phone and at such a great price. It is helpful to be able to ask questions to an experienced industry professional. Guarantee: If you purchase the all-inclusive SuperReview and do not pass the exam within 6 months, they will allow you to access to the same training at no extra charge. There is no money-back guarantee with the course but getting to retake the course at no extra charge can be quite beneficial. Students will have to provide the proper notification of exam failure and meet certain requirements to qualify for the guarantee. Money-Back Guarantee: SimpliLearn has a full money-back guarantee for their CISA Course. They allow students 3 days to try out the course and make sure they are satisfied. If a student is unsatisfied with the course and hasn’t accessed more than 50% of the content they can request a refund (be sure to see the full details of the guarantee on their site). Online Learning Content: The SimpliLearn CISA course combines 27 hours of audio/visual lessons with 79 “knowledge check” quiz questions throughout. This helps to reinforce what students have learned during the training. They also provide 5 full CISA Simulation Exams to better prepare users for the actual test. The Bottom Line: SimpliLearn’s CISA course offers a great deal of learning material, comprised mostly of in-depth audio/visual content backed by some practice questions. Although it could stand to offer additional practice tests, this is still an excellent study resource. Self-Paced Course: This course provides future audit and security experts with the resources to pass the CISA exam, and does so via a web-based program. With access to 15+ hours of interactive training for 180 days, you’ll have plenty of time to get prepared and use these prep materials on your own time. Included Content: This course comes with a ton of great resources to help you pass. Whether it’s the CISA workbook or the CISA chapter quizzes, there’s a lot of comprehensive material that comes with this program—all at an extremely affordable price. Presentation: While there’s a lot of great information and solid resources that accompany this content, the presentation isn’t ideal. It’s not an extremely exciting course, which may be difficult for those of you who need help focusing and staying on track. While it’s not without value, if you need a riveting video course, this isn’t your ideal match. Practice: This course has a ton of great features and a slew of different content types. However, there’s not a lot in the way of practice exams and extra ways to go over specific question types. While there are quizzes after each section, there’s no simulation work. 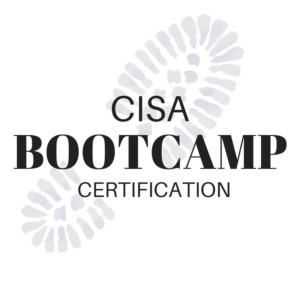 The Bottom Line: For a very reasonable price, CISA Bootcamp provides students with a plethora of educational resources over nine months of access. Still, their presentation and lack of practice exams leave something to be desired.